On the plane ride home to the funeral, Shadow meets a man who calls himself Mr. Wednesday, a self-declared grifter, who offers Shadow a job. Shadow, a man with nothing to lose, accepts. But he soon learns that his role in Wednesday’s schemes will be far more dangerous than he could have ever imagined. I know there are some at this office that still won’t believe me when I tell them I actually listened to the whole audiobook of American Gods, partially because of the fact that I did pick a book I had read years before to prepare for the possibility I wouldn’t actually listen to the whole book. But I did. This is in part due to the fact I was challenged to disprove those that thought I wouldn’t finish the almost 21 hour run time, but mostly because American Gods is such a great book. Neil Gaimen is a masterful storyteller. The book weaves together myth, fantasy, tale, and story seamlessly. Storytelling is one of the major reasons I’m on this crazy journey down the path of the entertainment industry. Recounting tales, fictional or not, is so ingrained in human nature and is a source of knowledge and entertainment that is unparalleled in any other industry. It’s older than the technology we use to tell stories, of even the language we use to tell those stories. As far back as history goes, people have been telling each other stories through voice around a fire, through drawings on a wall, or through actions in an amphitheater. My first love of story, that I can remember, came in the form of fairy tales in 4th grade. Throughout that entire year, we studied the art of tall tales, Grimm stories, and far-off fantasies. After that year, story could be found everywhere in life, even in mundane every day happenings. It’s amazing how today, even when just recounting what I did in a day, it is told in such a way that makes the telling more story like and dare I say epic, then just I wrote an email. This sense of story and love of all aspects of the telling was cemented through the performing arts and the study of mythology, which oddly mixed well. Greek mythology came to life through theatrical reenactments of Sinbad and the Odyssey, while at the same time I memorized lines for A Midsummer Nights Dream and read in history class about Egyptian gods, which are present in the book. American Gods has a cohesive storyline, but beautifully threads it with mythology and nods to history. Gaimen also wonderfully comments on the intrinsic human nature to pass along stories and beliefs, and through that belief gods are actually brought to life. Old gods and new gods, vie for the attention and favor of people. You don’t need to believe in these gods or any gods to enjoy the humanization of them in the book, and to entertain the possibility that gods and ghosts could exist alongside us in everyday life. It’s not often I revisit a book, because of the shelves full of books I have yet to read. So listening to this book while I drove around Los Angeles was a perfect way to remind myself of the love of story, myth, and fairy tale. 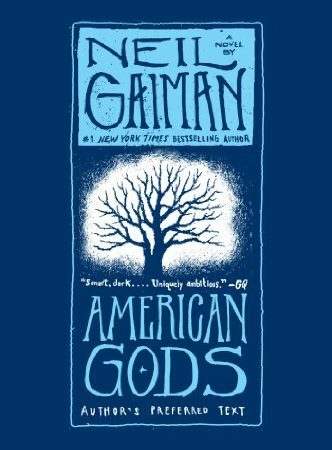 American Gods has been making recent news with the upcoming Starz TV show, but do yourself a favor and read or listen to the book first. Whether the show gets it right or wrong, the book is worth the listen to. Did you miss American Gods? Click here to check it out!